Michigan got a big wallop of snow this past winter, good news for most, unless, of course, you had to shovel the stuff. We heard, that for the first time in several years, the water levels of the Great Lakes reversed their decline – great news in the overall scheme of things. We didn’t think of what that would mean for a our favorite campground along the Lake Michigan shoreline…. Here’s a photo from August 2013. Here’s the same strip of beach yesterday. Thank goodness we still have great sunsets. Jezzy looks great in the soft pink sunlight as well. 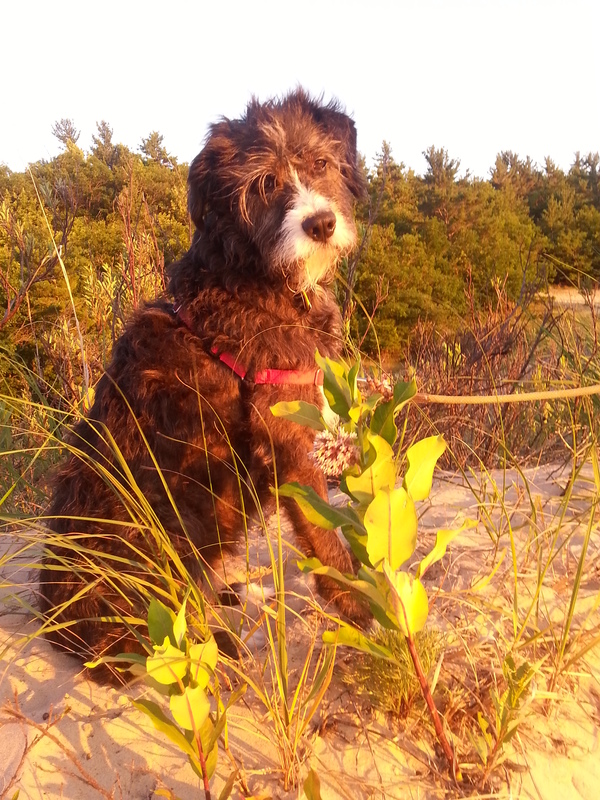 This entry was posted in camping, dogs, great outdoors, Michigan, national parks, simple camping, T@DA, weather by Judy Crankshaw. Bookmark the permalink. That is a big difference! Its been a couple of years since I’ve been to the Michigan Lakeshore; I’m looking forward to my visit in the fall. Jezzy is a cute pup! Funny that we live so close to the shoreline, but rarely visit. Don’t know if all the beaches have had the same dramatic change or not. Guess I should get out more! Thanks for checking in. I’m glad the water levels are up, but it must have been a shock to discover the beach had disappeared. The scenery is beautiful! And so good to see Jezzie up close. I thought she was gray. Was surprised to see the red. Is that just from the sunset? The red was just from the perfect pink sunset. Jezzy is gray from a distance, but has some brindle-y spots up close. God only knows what/who her parents were. Her coat is odd – probably one of the reasons she called out to me from the Humane Society, where I found her 7-1/2 years ago. She’s about 8-1/2 how, and going strong. You must have taken that photo of Jezzy during the “magic hour” of the day. That is the time of the day when the light is perfect! It’s a great photo. And those pics of the beach are amazing. Is your beach actually gone or is it due to high water that will recede? The high water will eventually recede. There are places along the shoreline in that area with a few feet of beach yet. Storms constantly rearrange the shoreline each year. But, that was a LOT of beach to lose (for now, anyway). I didn’t take the test – as a lifelong Michigander, I was afraid of embarrassing myself! The lake levels run up and down over a fifty year cycle. What’s been unusual is how quickly they have come up since they hit their low a couple of years ago. Once the storms work the beach over at the higher water levels a few times, it will look like a beach again. Great photos, especially the sunset and Jezzy! The funny part was how shocked I was….we hadn’t been in camp for 30 minutes when I grabbed Jezzy to stroll down to the beach. To get there, you have to stroll down a dune, then through a slot in another dune which opens to the beach. Well, the slot opened right into the water. Bet my jaw dropped 5″! Jezzy had to get her feet wet, which made her quite unhappy. I would imagine that a few big storms will churn things up quite a bit. We’re hoping to get back yet this year before they close the campground. Hope the high water levels don’t threaten beach homes when the storms of November hit. Remember the year when homes were collapsing into the lake? Feast or famine is right. Guess we just have to enjoy whatever we have. I will take this compared to the drought in the West, any day. The downside to our wet weather is that all my potted plants, which had been used to getting rained on nearly every day, all took a dive while we were gone for 10 days with no rain. My dreams of luscious red tomatoes growing abundantly in my back yard are toast! Hi Jezzy….I’ve been missing ya! She has missed you too, Carla. But, we have to wake her up to remind her of that from time to time. What a life she has! Thanks for those pictures again. 1986 and 7 the water was so high, the campground, we had in mind to camp, no room except for water. Seems like it’s either feast or famine with water levels. We lost some beach, but there’s great low-water wading out there now! Love all the pics but especially the last one of Jezzy. What a cover girl! She’s such a Princess. Thanks.